Adison Godfrey reviews "Little Fires Everywhere" by Celeste Ng. Celeste Ng’s latest novel, “Little Fires Everywhere,” revolves around a central question: what makes a person a mother? Ng opens her novel with the fire, but she then goes back to Mia and Pearl’s arrival to explain how the fire started. Mia and her fifteen-year-old daughter, Pearl, disrupt the status quo in 1990s Shaker Heights, a planned community in suburban Cleveland. And everything is planned, down to the colors residents can paint their houses. This by-the-book existence is a far cry from Mia and Pearl’s past. Mia, a fine arts photographer, is accustomed to moving from city to city with her daughter. But this time is different. Mia has promised they’re in Shaker Heights to stay. Mia and Mrs. Richardson find themselves on opposing sides. When Mrs. Richardson discovers that Mia works at the Chinese restaurant where Bebe is a waitress, she quickly realizes who must have told Bebe where her daughter was. She becomes indignant. She vows to unearth secrets about Mia’s past, comforting herself with the idea that she’s doing it for her oldest friend. The same can be said of Ng’s novel. This past March, slam poet Olivia Gatwood released her first collection of printed poems. “New American Best Friend,” which focuses on the struggles of girlhood and the common situations young women face, is affirming and moving. In Gin Phillips’ latest novel, “Fierce Kingdom,” a visit to a city zoo becomes a nightmare as Joan tries to protect her four-year-old son, Lincoln. Leaving the zoo at closing time, Joan realizes that the sounds she hears are gunshots, and that people and animals are being killed at random. 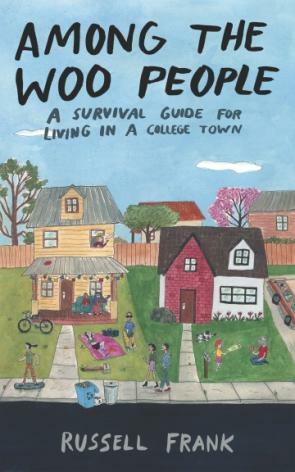 Russell Frank is a professor of journalism at Penn State, a contributor to StateCollege.com and a former columnist for the “Centre Daily Times.” He has compiled a selection of his columns from the past 20 years into a book, “Among the Woo People,” which comes out on Sunday. WPSU’s Adison Godfrey talked with Russell Frank about his book. AG: Thanks for joining me.